As part of ACT’s mission to serve our local community, we are proud to have recently launched the ACT Gives Back program. For each show in our season, ACT will choose one or more charitable organizations with which to partner. The innaugural ACT Gives Back outreach accompanied our December, 2018 production of A Christmas Carol. 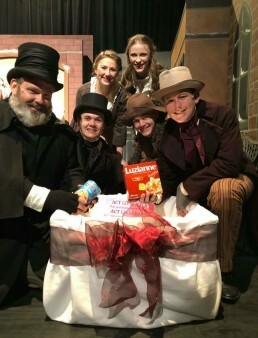 In keeping with the play’s message of good will toward our fellow man, we collected non-perishable food items from the cast, crew and audience members of A Christmas Carol. ACT Gives Back was able to donate over 150 pounds of food to the nearby Friendly Chapel F.L.A.M.E. food pantry, a local organization which helps to address food insecurity in our community.